He had been in love with various girls before he kissed Mrs. Elliott and always told them sooner or later that he had led a clean life. Nearly all the girls lost interest in him. In the early morning on the lake switting in the stern of the boat with his father roawing, he felt quite sure that he would never die. There were plenty of days coming when he could fish the swamp. "Big Two-Hearted River, Part II"
It may seem strange to pick In Our Time as Hemingway's greatest story collection because many individual stories in later collections have become more familiar—and are arguably more accomplished than these earlier tales. 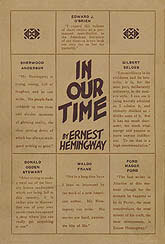 However, Hemingway's early stories set a new standard for story-writing. Strangely perhaps to our eyes and ears, these stories were absolutely shocking when they hit the public in 1925. Shocking because they were written so differently than anything that had appeared before. To some, they just seemed quirky. Juxtaposing the horrors of war and the mundaneness that those who live through it strive for. White-hot intensity without theatrics. Understated to the point of somnambulism at times but with heavy emotional undercurrent. For many this was writing for the new world after the First World War, the birth of genuinely twentieth-century literature. And the stories of In Our Time have proven themselves to be such, even if none of them on their own have stood out as blockbusters. Unlike some later Hemingway stories, they haven't been seen as suitable for movie treatment. But they are uniformly excellent. And they hang together well. In fact Hemingway gives each story a chapter number as if together they form a continuing narrative. In these stories we can see the serious young student of writing reach a mature level of assurance in developing his own style, a style that was unlike any before. Today when we read these stories we may not be as aware of how revolutionary they were, since the direct language and the understated sardonic attitude have become part of the mainstream, adopted to some degree by almost every popular writer since then. Yet, in our day, the stories of In Our Time read with a conflicted simplicity that is still fresh. The book introduces Nick Adams, a character apparently standing in for Hemingway, who will appear in dozens of his stories over the years. We see him at various points of his upbringing and early adult life in rural and backwoods America. The naturalistic stories are interspersed by contrasting vignettes from the war, usually told in the first person. They shot the six cabinet ministers at half-past six in the morning against the wall of a hospital. There were pools of water in the courtyard. There were wet dead leaves on the paving of the courtyard. It rained hard. All the shutters of the hospital were nailed shut. One of the ministers was sick with typhoid. Two soldiers carried him downstairs and out into the rain. They tried to hold him up against the wall but he sat down in a puddle of water. The other five stood very quietly against the wall. Finally the officer told the soldiers it was no good trying to make him stand up. When they fired the first volley he was down in the water with his head on his knees. Not a word too much or too little. Hemingway knows exactly what to leave in and take out. The collection ends with one of the strangest stories you'll likely read, "The Big Two-Hearted River" in two parts. Nick returns to an old fishing haunt and goes fishing. That's it. No other characters. No dialogue. No obvious conflict with man, nature or oneself. Just a man going methodically about his recreation with great skill and attention to detail. And somehow it's disquieting. Has he just returned from the war? Is he recuperating? Is he trying to recover the past? Is he escaping the past? Or is it just an uneventful story about fishing?